From Jonathan Frontado, Disney Cruise Line and posted on the Disney Parks Blog. 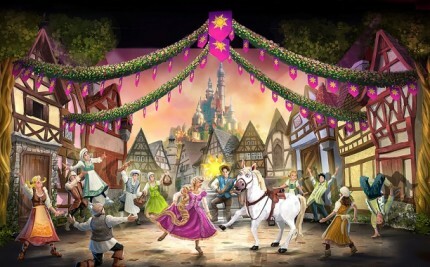 As development is in full swing to produce brand-new music, stunning costumes, storybook sets and more for “Tangled: The Musical,” the incredible Disney Magic cast is putting the finishing touches on the show to get it ready for audiences this November. We asked two of the key creative players to “take 5” during rehearsals and tell us more about the production. Show director, Gordon Greenberg, and choreographer, Connor Gallagher, told us all about the immersive and interactive environment they’re creating for the stage. Check out the video below for more details and never-before-seen footage from cast rehearsals!